Larry J. Sabato's Crystal Ball » Hard targets? One needs little more than just fingers and toes to count the number of House members who represent districts won by the other party’s presidential candidate in 2012. As mentioned here previously, just 25 House members — nine Democrats and 16 Republicans — hold such “crossover” districts. Compare that to 2004, when there were 59 such seats, or 2008, when there were 83. Both Democratic and Republican strategists are going to start with these seats as they try to identify targets for the upcoming campaign, but as is clear from a district-by-district analysis, many of them are not particularly vulnerable. The nine Democrats can generally be put into two categories: newish members who barely won in 2012 and who present the most attractive targets for Republicans in 2014, or moderate-to-conservative lifers whose seats will be particularly vulnerable if the incumbent retires. The 16 Republicans, meanwhile, are a bit more varied. A handful of these representatives — like Reps. Jeff Denham (R-CA) and Mike Coffman (R-CO) — are relatively new members who were elected to favorable districts that became more Democratic in last cycle’s redistricting; others are long-time Republicans who dissuade challengers through their seniority, but whose districts would also present attractive targets in the event of a retirement; still more are members elected as part of the 2010 wave — like Reps. Chris Gibson (R-NY), Joe Heck (R-NV) and Scott Rigell (R-VA) — or through bad Democratic challenges (California Reps. Gary Miller and David Valadao stand out in this category). One cannot stress enough how the lack of crossover seats benefits the Republicans; despite the fact that they hold a greater number of crossover seats — 16 for them to only nine for the Democrats — the Republicans could lose all their crossover seats and still hold a 218-217 House majority. Democrats need to net a gain of 17 seats to win control of the House next year. According to the Congressional Research Service, the average length of service for House members at the beginning of the current 113th Congress was 9.1 years. The 25 crossover district holders have, on average, served slightly longer — 10 years — than the average House member. The 25 names below have widely varying years of service, though. More than half (13/25) were in the House for four years or less as of January. These, generally, are the more attractive targets. Notes: *Years of service are as of the opening of the 113th Congress (January); ^ Miller’s opponent was a Republican because California has aa primary system where the top two finishers, regardless of party, advance to the general election. 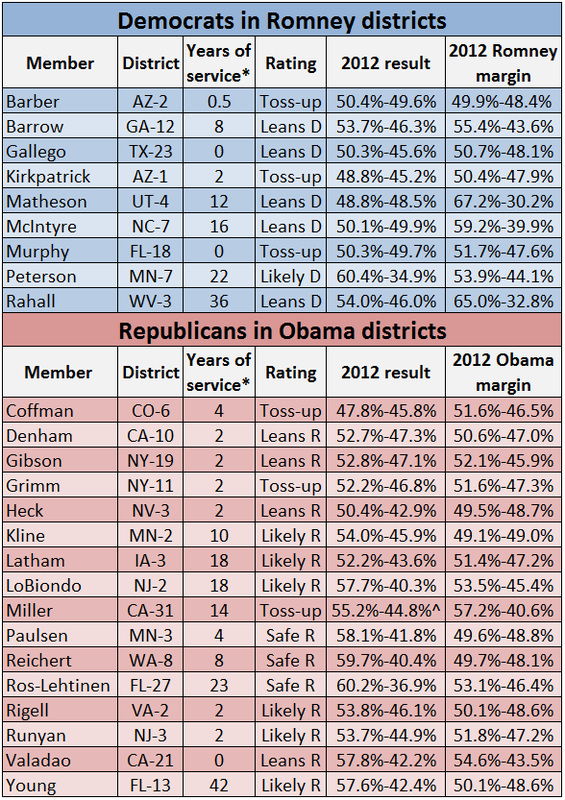 Source: Obama/Romney district results from Daily Kos Elections; other figures from Crystal Ball research and the Almanac of American Politics. What follows is a full analysis of all 25 crossover seats in the House. If Republicans have a good night in the House, some of the Democrats below will lose or will have retired before the election; likewise for the Republicans on this list if the Democrats have a good night. As an aside, it’s possible that veteran Rep. Peter King (R, NY-2) will be the 26th House member who holds a district won by the presidential candidate of the opposing party, but complete results from his Hurricane Sandy-ravaged Long Island district are, incredibly, still pending. In any event, King is safe. We’re making only slight changes to the House ratings this week. Rep. Julia Brownley (D-CA) probably should have been on our initial ratings; California Republicans are going to have trouble picking up any seats in the deeply Democratic Golden State, but Brownley and some others could be beaten under the right circumstances; former state Sen. Tony Strickland (R), who the freshman Brownley beat by slightly more than five points in 2012, is running again. The seats of Reps. Tom Cotton (R-AR) and Kristi Noem (R-SD) are now listed only because they have been mentioned as possible Senate candidates. If the seats became open, Democrats could potentially compete in either; if they do not, both incumbents should be fine in their reelection bids. Meanwhile, after former South Carolina Gov. Mark Sanford’s (R) runoff primary victory on Tuesday in the special election to replace appointed Sen. Tim Scott (R), Democrat Elizabeth Colbert Busch (sister of comedian Stephen Colbert) has an outside chance to win the seat, given Sanford’s baggage. However, the Republican has to be considered a favorite right now; if Colbert Busch somehow won, she would hold the fourth-most Republican district (based on the 2012 presidential results) of any Democrat in the country.